Home / Essentials / News / Sports / Three in a row! It was a history making moment on Thursday, March 21. Shenton College won the A-Division Interschool Swimming Championships for the third consecutive year! The Shenton spirit was alive and well on this great day and the power of these whole school events to connect students and give them a sense of belonging and pride cannot be under-estimated. There was resilience and integrity displayed by all the students, whether they competed, were reserves ready to swim if needed, or were in the stands cheering on their peers. Of course there were outstanding individual results on the day, including seven championship swimmers for their age group and two state school records set for Year 7 Girls 4 x 50m freestyle relay and Year 10 Girls 4 x 50m freestyle relay. 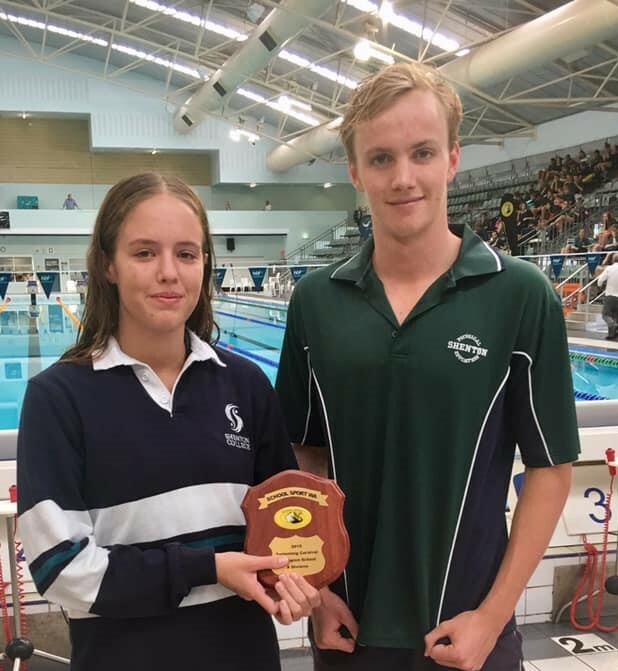 Swim Captains Rowan Brown and Isabelle White, who have been racing for the College for the past five years, brilliantly led the team, and the standard of the younger swimmers bodes well for more championship wins in the future. Only days earlier the Shenton dive team won the SSWA State Diving competition, also for the third year running! Many of the students were first time divers and benefited from a master class with WAIS dive coaches before the event. There were some great dives on the day and well done to all the students who participated.